United Kingdom, Republic of Ireland, Thursday 2nd August 2018 – Canon Europe has today unveiled the Canon Zoemini, a lightweight, pocket size and portable photo printer, featuring ZINK (zero ink) technology. 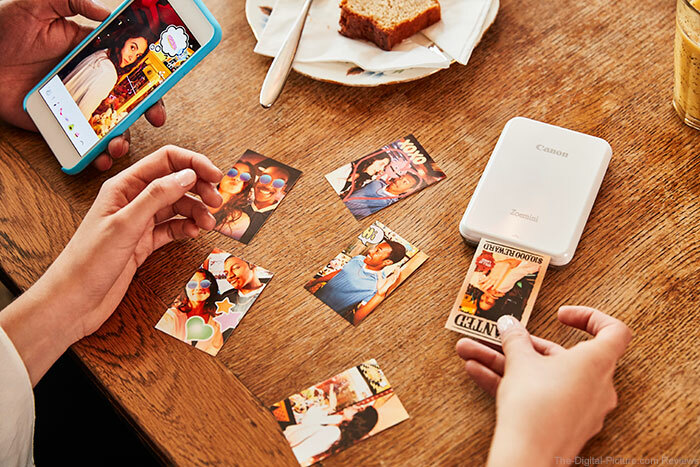 The Canon Zoemini connects seamlessly to the Canon Mini Print app via Bluetooth for instant printing of photos and social media snaps in a matter of seconds. The Canon Zoemini prints out personalised 2x3 inch (5 x 7.6cm) photos, straight from a mobile phone, tablet or social media apps. The Canon Zoemini features ZINK technology, meaning zero ink is required. The rechargeable battery-powered portable printer comes with a starter pack of 10 x Canon ZINK photo paper (peel-and-stick back, smudge-free, water and tear resistant), with additional paper available for purchase in packs of 20 or 50. The Canon Mini Print app also features a tiling function, enabling the creation of larger posters or images made up of four or nine prints, as well as over ten unique collage templates that prints a 2x3 inch photo. From retro selfies to playful animal face filters, the Canon Zoemini provides the ability to customise and quickly print off memories. In addition to Instagram and Facebook, the Canon Mini Print app lets users connect with Google Photos and Dropbox, so they can print their physical copies of their most treasured memories while out and about. A mobile device must be connected to the Canon Zoemini Photo Printer via Bluetooth and the Canon Mini Print App, available for free on the App Store and at Google Play. Compatible with mobile devices running iOS 9.0 or later, and Android devices running Android 4.4 or later. The Canon Zoemini will be available in Rose Gold, White and Black from September 2018 with an RRP of £119.99/€139.99.